With Christian T Shirt Fundraisers you can raise funds and awareness at the same time! It's a really great idea. For example: Your Churches name and photo, or a verse out of the Bible etc.. Then you will sell the T Shirts to your supporters and others. And yes it can be very profitable and rewarding. Then every time someone wears one of the T Shirts you will be raising awareness about God and your Church! It couldn't be better. By finding a local clothing manufacturer that will print you customized shirts at an affordable price. There are many companies that do this and they will allow you to design the shirt in whatever way you wish! Try to get the shirts at an extra discounted price using the fact that you are a Church trying to fundraise as reasoning! My Most Recommended: The second way is by using an online Apparel store or an Online T Shirt Crowdfunding campaign. This way has a real advantage because there are no upfront costs, and your supporters can go online and buy shirts one at a time. This means no bulk ordering needed and no leftover shirts that you haven't been able to sell. But importantly, you are still able to bulk order at a discount if you wish to as well! The last way is by using companies that specify in Christian T shirt fundraisers... 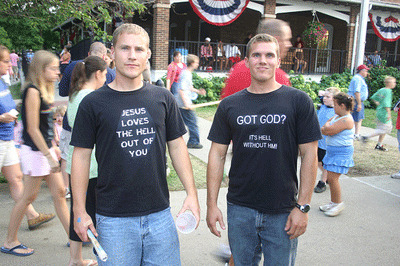 Meaning that they supply all sorts of Christian T shirts. They usually have decent prices and will probably help you with your fundraiser! They're a good option but obviously you won't be able to get customized shirts to match your Church! Your first step towards running a profitable Christian T shirt fundraiser is by picking the right design and themes. You will want something that will be popular among your supporters and that they will just have to buy. It could be a simple shirt that just has your Church name and a Verse from the Bible, or it could be one with an image of your Church or of Jesus printed on it! Or what about a T shirt focusing on a certain section of your church like your Youth Group. There are lots of different options so be creative with it and decide on what will be the bestsellers! Obviously if you choose to use a Christian T shirt fundraiser company you will have loads of different Christian shirt designs to choose from... Once again find the designs that will be most popular. Another really great time to hold Christian T shirt Fundraisers is after Church events. Like for example, after a youth camp! Your design would obviously then be a photo of your youth group at the camp, with a caption like, "Westmore Church Youth Camp, June 2009!" The next step will be to get your desired amount of shirts printed (That's if you're not using a company like SSA Stores). Or you could show people the design and then get them to pre-order the shirts... That way you will know exactly how many you will need. I would also suggest that you take payment for the shirts when people order them. Of course, if you're using an online apparel store or a T Shirt Crowdfunding campaign, then you won't need to order the shirts. You can just send members and supporters to your store or Crowdfunding page, when you've finished designing! Advertising your shirts properly shouldn't be too hard as you will mainly be selling to your members and supporters. Advertise on your Website and through your newsletters. Also have a way for people to buy shirts off your website or have a link to your online store. Also use all your social media platforms to promote the fundraiser. Use word of mouth and posters at your church. And if you're holding an auction or an online auction through you could look to use your shirts as items in those auctions! A great strategy could be to recruit your youth group as a sales team and get them to sell to all their family and friends. Come up with some incentive prizes as encouragement and you'll see those kids sell the shirts like crazy! Get a copy of "Let's Raise Money" for some great fundraising sales advice. Some other places you could sell your shirts at would be at all your events, local markets (if you have a market stand there), and at other local events. Read here for more ideas on promoting Christian T Shirt Fundraisers. Then head over to SSA Stores and setup your free online Apparel Store, which will also supply the Apparel stock for your offline store. And if you haven't already... Setup your FREE online Donation / T Shirt Fundraising page here.